The bright flavors of lemon, garlic, and sage transform bland chicken breasts in this simple and fast marinade. 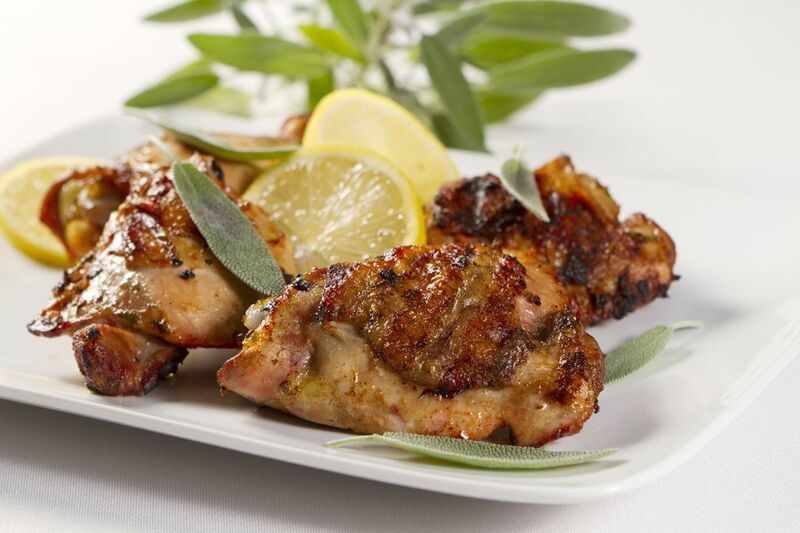 We like bone-in chicken because the bone adds flavor and the skin holds in moisture. You may substitute boneless, skinless chicken breasts, but reduce the cooking time to 25 to 30 minutes, depending on the thickness. Plan ahead to marinate the chicken at least 6 hours before grilling or baking. Place garlic in a food processor and process to a puree. Add olive oil, honey, kosher salt, and pepper, processing to combine. Add lemon zest, lemon juice, and sage. Pulse a few times until sage is rough-cut. Pour the marinade into a freezer zip-top bag. Add breasts, seal, and toss to coat the pieces. Open the bag, squeeze out all the air so the chicken is covered, then seal again. Refrigerate at least 6 hours or overnight. Let sit at room temperature for 15 minutes before grilling or baking. Discard the used marinade. To Bake: Preheat oven to 400 F. Line a rimmed baking sheet with foil, and insert a baking rack. Bake chicken breasts for 40 to 45 minutes or until meat thermometer reaches 170 F in thickest part of the meat not touching bone. Crisp the skin under the broiler for a few minutes, if needed. Do not overcook or the chicken will be dry.